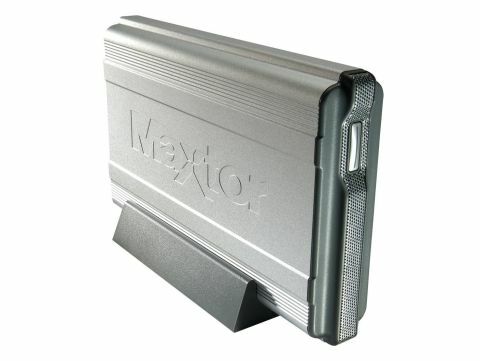 Compared with the super-slim LaCie Mobile Hard Drive, the Maxtor OneTouch II is something of a brick - maybe even a breezeblock. For a start, it's eight times as heavy as the LaCie model, and needs its own AC power supply. However, while these are major considerations if you're lugging the beast around with you, the Maxtor has a lot going for it if you just want an extra hard drive onto which you can back up data. Firstly, it has a voluminous 300GB storage space and, while it's no lightweight, the shell is neatly styled with some design flourishes and real body strength. There's a stand you can use to position the drive vertically, so it takes up less desk space. It's also versatile enough to make use of either a FireWire or a USB interface port, maximising your choices for connections. Drives with just one port are also available. Installation is quick and easy, and even includes an option to back up all local drives immediately as part of the process. From then on, the supporting Retrospect Express software makes it simple to schedule regular backups, as well as enabling you to create multiple back-up sets and easily retrieve files from any of them. You can customise the OneTouch button on the hard drive's front panel to carry out any of a number of options and you can also set password protection to limit access to your files.